In the past few months, we have seen tons of spy shots for the upcoming BMW i8 Coupe, but not even once have we heard rumors about a possible roadster version of the car. 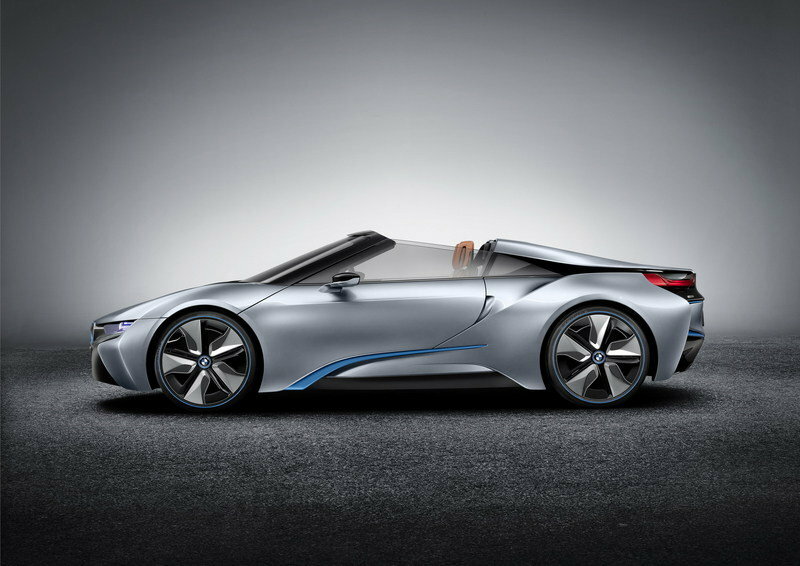 Somehow, BMW has been able to keep a tight lid on this project, but they are now unveiling the first details of the BMW i8 Concept Spyder. Spyder models are generally top-less versions of their Coupe counterparts, but the new i8 Spyder has a slightly shorter wheelbase and overall length than the i8 Coupe. 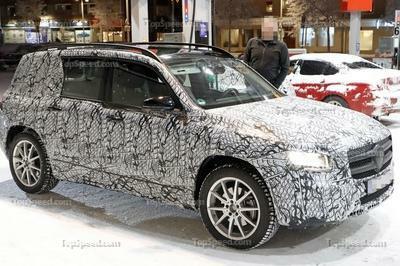 It has also received laser headlights, a semi-transparent "V" hood, and a rakish windscreen with an integrated spoiler. Like its coupe brother, the new i8 Spyder combines two different power sources: a 131 HP electric motor on the front axle with a 223 HP turbocharged three-cylinder petrol engine on the rear wheels. With a total of 354 HP, the new concept will sprint from 0 to 60 mph in 5 seconds and can hit a top speed of 155 mph. 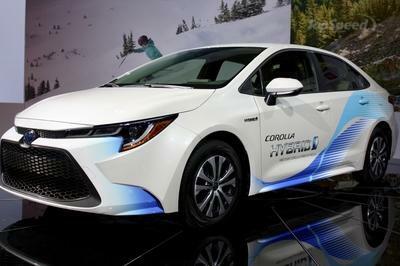 While running on electric only, the car has an autonomy of 19 miles. 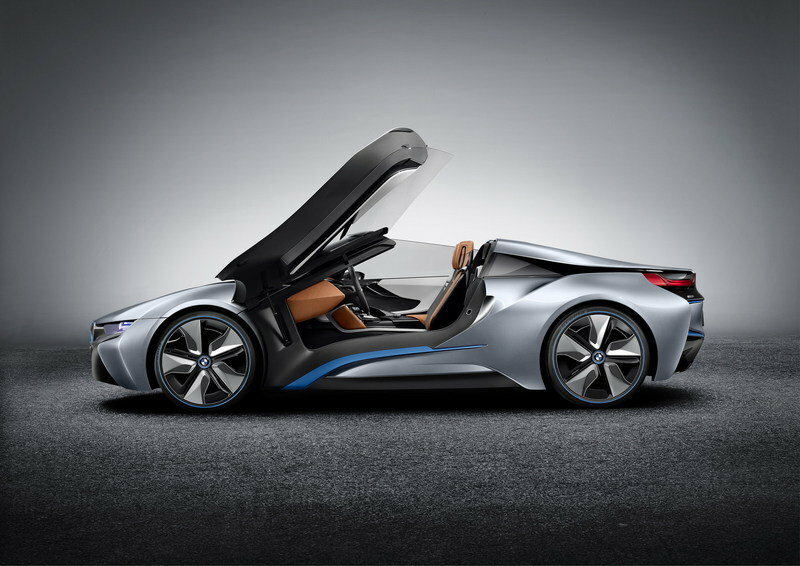 Hit the jump to read more about the new BMW i8 Concept Spyder. Compared to the i8 Coupe, the new Spyder version has a slightly shorter wheelbase and overall length. At the front of the concept are headlights with laser light technology and a semi-transparent "V" hood which opens out from the front end of the flat bonnet towards the windscreen and beckons the eye to the electric motor below. 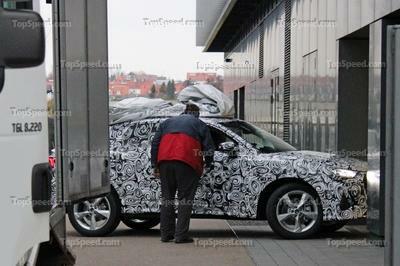 There is also a spoiler lip on the windscreen frame which guides the airflow over the heads of the passengers. 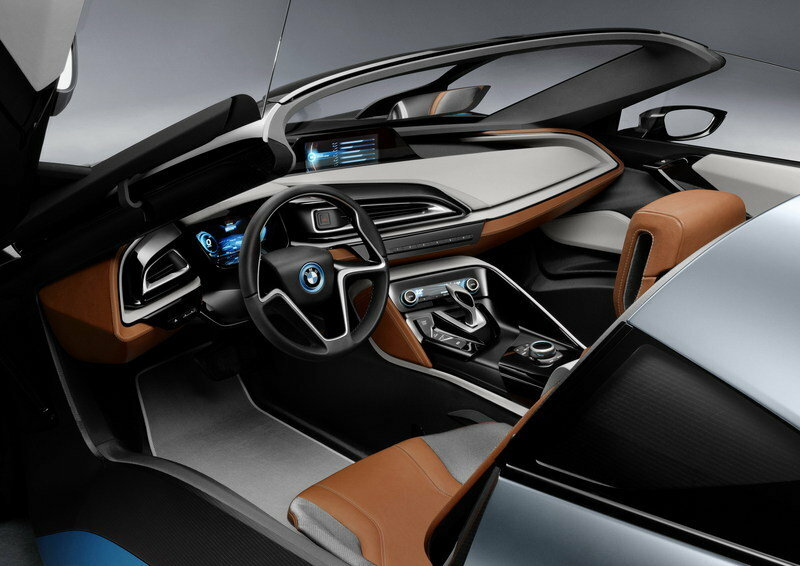 Viewed from the side, the new i8 Spyder will be immediately recognized thanks to its alluring lines and forms, as well as the doors which open by pivoting forwards around the A-pillar axis. At the rear, there is a transparent cover revealing the two folded electric kickboards below, a visually imposing rear diffuser, three-dimensional air outlets, and U-shaped rear lights. The dynamism and the beauty of the exterior is combined with the elegance and luxury of the interior. The cockpit brings together the instrument panel, steering column, and steering wheel with the instrument cluster, central information display, and control elements. The interior was designed to offer the best driving experience so the concept features a low seating position, while all the controls are in just the right position and, like the other functional components of the interior, designed to further enliven the driving experience. All the information needed will be displayed on a 8.8-inch (22.4 cm) screen. The entire interior is a mixture of plastic, carbon, and leather, in a combination of white and bold orange. 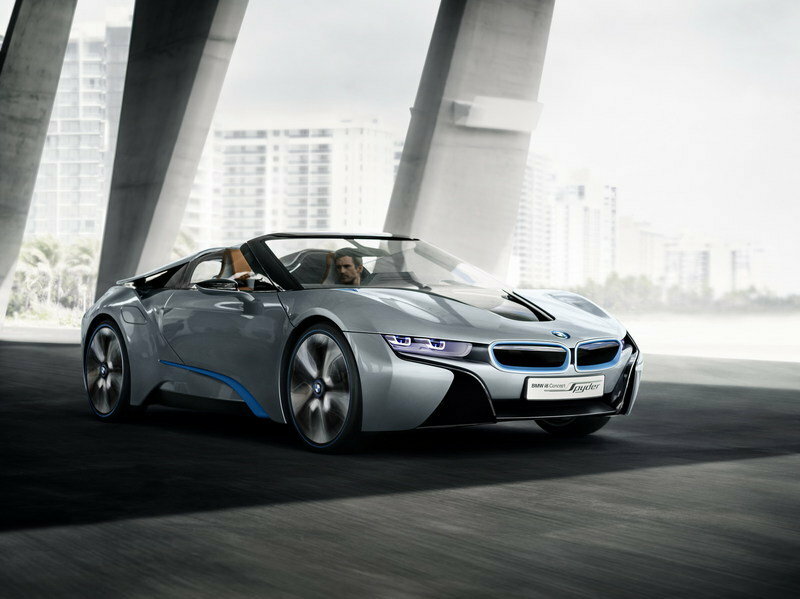 The BMW i8 Concept Spyder is powered by the same plug-in hybrid system found on the coupe version: a 131 HP electric motor on the front axle with a 223 HP turbocharged three-cylinder petrol engine on the rear wheels. With a total of 354 HP, the new concept will sprint from 0 to 60 mph in 5 seconds and can hit a top speed of 155 mph. 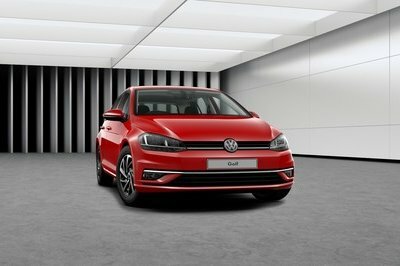 While running on electric only, the car has an autonomy of 19 miles, while the petrol engine delivers an impressive fuel economy of 94 mpg. The electric motor is powered by a lithium-ion battery which can be fully charged from a domestic power socket in less than two hours. 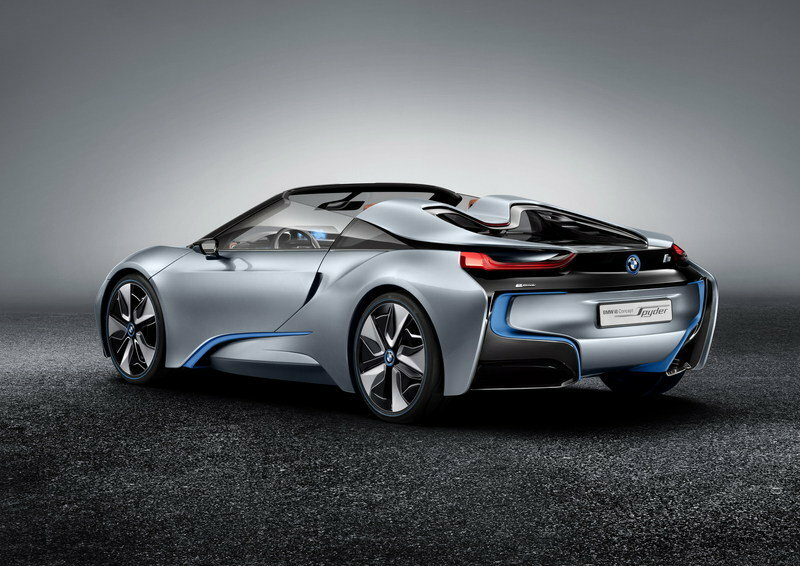 BMW hasn’t said anything about sending this baby to the production lines, but expect a production version of the i8 Spyder to follow the production i8 Coupe by one year. Finding a sports roadster that delivers the same performance numbers as the new i8 Spyder should be pretty easy, but finding hybrid sports roadsters with the same technology is difficult. For now, we will only focus on the regular models like the Mercedes SLS AMG Roadster and the Audi R8 Spyder. Both are very impressive models that will undoubtedly be cheaper than the i8, but the i8 has the advantage of delivering the best fuel economy of them all. Spyder would be an eye-catching supercar if ever it is to be produced. Only BMW Spyder has futuristic and modern designs that make it outstanding. This concept must be applied precisely. The concept is great! It’s another ground-breaking concept of Spyder. Spyder is a supercar concept with noticeable exterior because of the innovative features. It’s very attractive most especially on guys like me. Having this sport-luxurious car to your house already lifts your mood and saves it all throughout the day. The colors are really something. More than its built and design, it is what would attract you initially. This automotive appears great in any angle; the feel of aggressiveness is evident on each of its components. I think its styling is a trying hard; it’s undeniably looking fierce, but there’s this part where it looks slightly awkward. Anyhow, it’s most likely to be deeply liked by consumers because of its driver-oriented interior. The amazing fuel efficiency feature sounds promising too. I’m speechless upon seeing it. Seriously, there’s nothing left to comment when your brain has automatically processed that it is greatly appealing in all aspects. This concept will be a big hit to enthusiasts who greatly considers style. They need not to worry about its performance as clearly, it is also high in dynamics. As I said on the other article about this, I’m truly in love with this hybrid sports car. It is purely flawless to me!